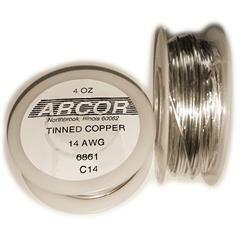 This tin-plated copper wire solders very readily to lead or foil. It is often used in small loops to provide a place for attaching nylon thread or chain for hanging your stained glass suncatcher or panel. Easily bendable, it can be used in many other ways in the design and construction of stained glass works. Flower stems, halos, antennae, airplane struts, and the bars in the windows of a diminutive stained glass jail house are just a few of the many uses that spring to mind. 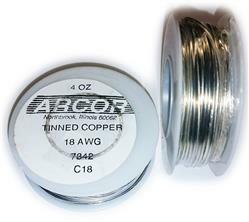 18-gauge tin-plated copper wire in a 4 oz. spool, or about 50 feet. This is 14 gauge tin-plated copper wire in a 4 ounce spool, or about 20 feet. Remember, 14 gauge is heavier than 18 gauge, because that's how wire works. 500 Foot Spools Of Tinned Copper Wire in 14, 16, 18 and 20 Gauge. Two of these are identical in gauge to the smaller rolls we sell. The others lie in between. Whereas the smaller spools of 14 and 18 gauge contain merely 20 and 50 feet, respectively, here you have the economy of scale to a great degree, as you will discover by performing some simple calculations. The 20 gauge is the lightest, and the 14 gauge heaviest, which is how wire works, and which you can gather by reading the descriptions aforesaid.